Been looking for something to put into a 6 knob 125B, this looks like a winner. 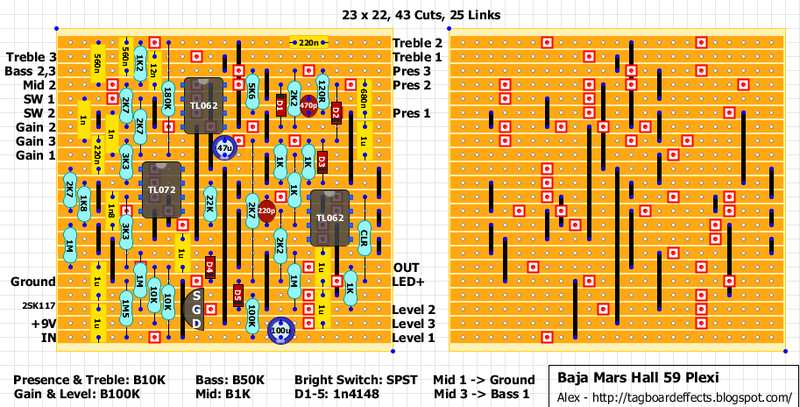 This is one i been wanting to check out and the Baja EVH5150.Thank you Alex,your layouts always look great to me. Be careful if you build this: layout is actually 23 x 22. It's been corrected. I believe the schematic has the cap value coming off the 2sk117 source at 1u. Thanks Michael. I've used the Bassman layout and forgot to change the value. Thanks Alex for the headsup on the correction.I always save all the new vero layouts as soon as they are posted then watch for any corrections then resave those as i delete the older ones. 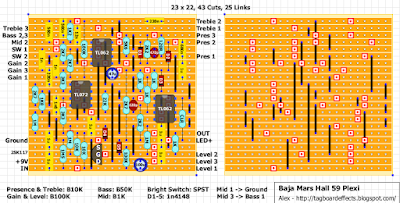 I guess I can't say the layout is officially verified, as I had altered mine a bit (additional power supply filtering and moved things around to accommodate strain relief holes), but considering my layout started off as Alex's, I'm sure it's good to go. Initial test sounded pretty good. Seems to only have a mild level of crunch though with the Gain cranked and Presence turned up a good bit. Increases a bit when digging in, I guess like an older tube amp. Most likely needs to be pushed by another boost or OD, although I didn't get a chance to check that out yet. Having never heard a '59 in person, I can only assume this is a faithful representation. Sounds good though. I had used LEDs for the final clipping, but one of them barely lights up with everything dimed, 1n4148s are probably the better choice here. I'll swap them out tonight and check it out with another boost in front. I may also tweak the 2k7 feedback resistor as Frank mentioned over at FSB. Again, thanks for another great layout Alex! Ok, the 1n4148s at the end definitely sound better than the LEDs I had tried. Increasing The feedback resistor up to about 5k1 sounded ok, but I settled back on the 2k7. Probably not worth a switching option. A boost in front livens things up a bit as expected. Might acually be a good pedal platform for testing treble and germanium boosts. IMO, sounds decent for rhythm as is, then kick in a boost for the leads. Looks like this might be the one to get me back into building pedals after a long time of quietness. Is there a substitute to the 2sk117? Can I use a J201?